The noble gases are all non-metallic elements. They are colourless gases at room temperature and pressure, with very low melting points and boiling points. They are colourless, odorless and non-flammable. 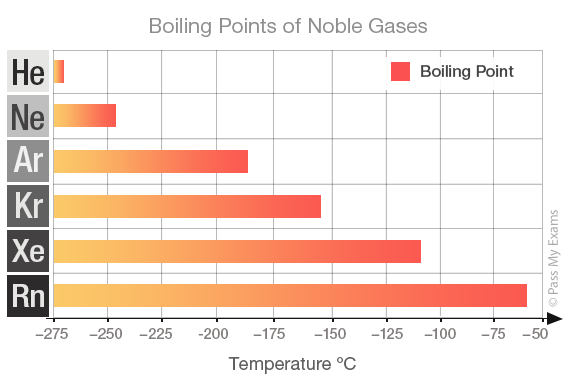 The noble gases all have low boiling points. This is a typical property of non-metals. Helium has the lowest boiling point in the group. However, for the noble gases the significantly low boiling points are due to the weak interatomic forces between the monatomic atoms. The boiling points increase down the group. The weak interatomic forces increase as the size and mass of the atoms increases. The density of a substance is a measure of how heavy it is for its size. The particles in gases are spread far apart, so gases have low densities. Helium has the lowest density in the group. The densities increase as you go down the group. 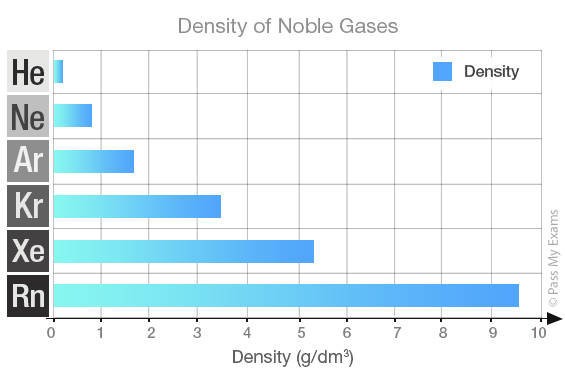 Radon, at the bottom of the group, is the densest gas. They are unreactive because their atoms have stable arrangements of electrons. Stable arrangement means their outer shells are full. This can be demonstrated by looking at the electronic structures of the noble gases. The highest occupied energy levels (outermost shells) of their atoms are full, making them unreactive.